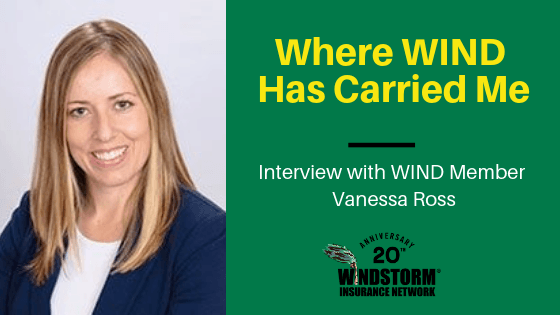 As part of our 20th anniversary this year, we’re profiling our members on “Where WIND Has Carried Me.” When WIND was formed in 1999, the goal then (and now) is to offer education and industry insight to representatives from all facets of the property/windstorm insurance claims industry. I joined WIND because it is the preeminent group in the property and casualty insurance industry. The insurance industry is a closely connected group and those who know property all gather at WIND each year. The ideas being passed around in the classes and in the halls, and even after the conference classes have ended, are a must if one works in this industry. To have prominence in this field, you have to be a part of WIND. I have met amazing professionals, shared stories, swapped ideas, and bonded over the camaraderie we all have in dealing with claims. When I worked on the defense side of the industry, I met leaders at insurance companies and learned their business needs. Now that I represent the insureds, I learn new legal concepts, mingle with others “fighting the good fight” for policyholder rights and reinvigorate my passion for the law. I have attended WIND conferences for years. I previously worked at a statewide insurance defense firm representing first-party property insurance carriers. I attended WIND conferences and mingled with the claims industry and engineering firms. I connected with experts I needed to assist me in my cases and acquired new contacts within insurance companies and third party administrators. Now on the policyholder side, I speak at the events and share my new perspective on the law as it applies to first-party property. I meet and share ideas with plaintiff’s attorneys, defense attorneys and public adjusters. I meet new faces and reconnect with old friends and colleagues. Attending the WIND conference is a Must in this industry. The conferences provide the place where all the top property insurance professionals meet and connect. Anyone who is anyone in the industry is there. It provides a great place to share ideas, and learn new ways to help my clients. If you could change one thing about WIND, what would it be? WIND is the one conference that provides access to both sides of the industry to come together and learn from each other. The adversity may be lessened if we can each listen and understand the other’s perspectives. Through understanding the differences and problems in the industry, both sides can try to curtail fraud and dishonest business practices. I wish others understood that WIND represents first-party property in Florida and around the country. We are all in this industry together, and a lot can be learned by both speaking and listening. WIND is a must in the insurance industry. If a professional is young and starting out, it can be a great learning tool. The classes will train you on how to handle claims on a daily basis. If one has been in the industry a while, I would encourage attendance to see what is new and the latest in the law and how to handle new trends and challenges that present themselves all the time. The insurance industry is forever evolving. The laws are changing, and insurance companies change business practices as a result. I have seen several such evolutions in my career. Hurricane claims seem to be driving the new trends. We are at the beginning and will see what happens next to change the industry.